OAKLAND, Calif. — Much like teammate Tim Lincecum has discovered, Jered Weaver is realizing that his fastball can still be effective even though it's no longer the dominant pitch it once was. The Athletics certainly couldn't handle it on a day when Weaver was nearly unhittable. Weaver bounced back from two rough starts to pitch a three-hitter, and the Los Angeles Angels held on to beat the Oakland A's 2-0 on Sunday. "I just tried to pitch to contact," Weaver said after winning for just the third time in his last 10 starts. "I know I'm not a guy anymore that's going to go out there and strike people out, so I try to limit pitches. They were able to hit the ball but luckily they were at people." Weaver (6-6) had given up 11 earned runs over his last 11 1/3 innings before helping the Angels to their fifth win in six games against the A's this season. The right-hander had only one strikeout but faced just two over the minimum on the way to his first shutout since May 8, 2015. It marked just the fourth time in 14 starts this season that Weaver has gone past the sixth inning. "No doubt, his fastball command set everything up," Angels manager Mike Scioscia said. "The big thing was getting some pitches in good zones on some deeper counts, which there weren't many of them. He pitched a terrific game. One of the few groundballs he got was a double play ball." Albert Pujols drove in one run, Johnny Giavotella had two hits and Carlos Perez broke out of a long slump a solo home run leading off the fifth. Both of the Angels runs came off Oakland starter Eric Surkamp (0-5). 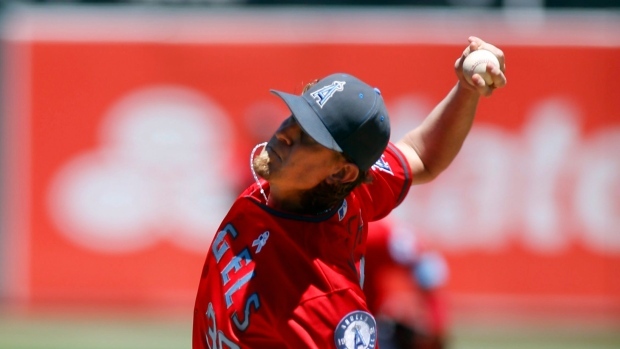 Weaver was stellar all afternoon and got plenty of help from the Angels' defence. Los Angeles turned a double play in the second after Yonder Alonso's one-out single. Center fielder Mike Trout also threw out Billy Butler at second base in the fifth when the A's slugger tried to extend a single into a double. "Today was frustrating," Oakland catcher Stephen Vogt said. "Up and down the lineup, including myself, we didn't make him work. A guy like him, every pitch looks hittable but that's not the case. We expanded it and kept getting ourselves out." Yunel Escobar opened the game with a leadoff single, took second on a walk to Kole Calhoun and scored on Pujols' fielder's choice grounder. Perez homered leading off the fifth to snap out of a 3-for-33 funk. Surkamp allowed two runs and six hits in six innings. He had five strikeouts and two walks. The A's lost for the fifth time in six games and dropped to 2-5 on this nine-game homestand. The Angels' clubhouse was still buzzing about the one-hop throw to second base that Trout made from centre field to nail Butler. "I was kind of surprised that Billy went because he hit it so hard out there in the gap," Weaver said. "But he tried to be aggressive and Trout was able to make a great throw." Angels: C Geovany Soto will travel with the big league club to Houston and could begin a rehab assignment by the end of the week. Athletics: OF Khris Davis was held out of the lineup with a mild calf strain. ... RHP Henderson Alvarez's rehab has been put on hold after he was pulled from his latest outing with soreness in his shoulder. Alvarez will meet with Dr. Andrews this week for further evaluation. ... LHP Rich Hill (groin strain) threw 30 pitches in a bullpen session and will face hitters on Wednesday in a simulated game. ... OF Josh Reddick will begin a rehab stint in the minors and could rejoin the team when it hosts San Francisco on June 27. ... RHP Liam Hendriks was reinstated from the disabled list. Andrew Triggs, who got a no-decision in his first career start Saturday, was optioned to Triple-A Nashville. Angels: RHP Jhoulys Chacin (2-2) pitches the series opener in Houston on Monday. Chacin has struggled with a high pitch count in each of his previous three starts but is coming off a win over Minnesota. Athletics: RHP Sonny Gray (3-6) starts against Milwaukee on Tuesday at the Coliseum following an off day Monday. The Oakland ace is winless since April 22.